The League Scheduler automatically pairs teams, rotates courses, and sets tee times \ start holes for your league. You also have the option to manually schedule team pairings, set courses, and tee times. To view the Automatic League Scheduler…from the Setup menu, choose “Automatic Scheduling”. The Automatic League Scheduler displays the match, tee time, and course played for each event. The first column displays the event number, the second column the event’s date, the third column the type of event, and remaining columns display each match in teetime order. Type in the number of events your league will have for the season. Set any special type of events your league has under the “Type” column. There are two types of pairing modes; automatic pairing or manual pairing. Automatic Pairing — League Manager pairs the teams automatically. The schedule makes sure that every team plays with every other team. Plus courses and tee times are rotated automatically. Manual Pairing — you can manually pair the teams for the event. Use Manual Pairing for “Position”, “Tournament”, or any other type of event that you don't want the scheduler to automatically pair. To change the pairing mode, double-click your mouse on the “Type” cell. Click on the correct event type. Example: To enter a position night for event #8, double-click the “Type” cell for event #8. In the “Event Type” box, put the dot beside the “Manual Pairing with custom description” option, and type Position in the box. You will now be able to manually pair teams for your position night. Click the Manually Pair Teams for event 8 button, to pair teams. See Manual League Scheduler for more information. Note: If your league has a split season, the Scheduler does not need to know about a split. You can set a split at any time. See Split Season for more information. Set courses and tee times. 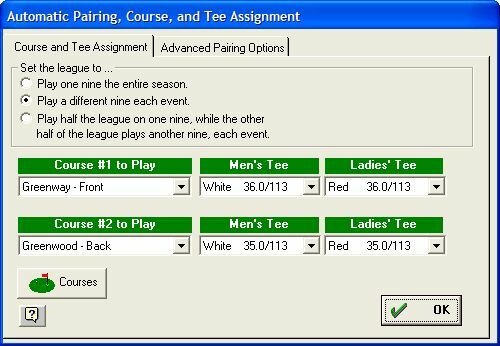 League Manager will automatically assign courses and tee times for each event your league plays. Click the Build Automatic Schedule button and the following screen will appear. League Manager allows your league to play on any number of courses. The available courses are displayed in the “COURSE# TO PLAY” list. You must specify a course for League Manager to function properly. League Manager uses the ratings and slopes of each course to calculate handicaps. Also, course pars and hole handicaps are used to calculate points, pars, birdies, eagles, skins, etc. If you do not specify a correct rating, slope, hole handicaps, and pars for each course\tee your league plays, the LEAGUE MANAGER WILL NOT calculate points and handicaps correctly. If you need to add or edit a course, click the Courses button. See Entering Courses for further information. Mark this option if your league plays only one nine for the whole season. Select the course your league will play in each “Course Play” list. League Manager will automatically assign this course to be played for the entire season. Mark this option if your league alternates play over two or more nines during the season. Select the first course your league plays (for event 1) in the “Course #1 to Play” list. Select the second course your league plays (for event 2) in the “Course #2 to Play” list. League Managerwill automatically assign courses, alternating course #1 and course #2 for the season. Note: If your league plays 3 or more courses you will need to manually specify which course the league plays on a given event. See Manual League Scheduler for further information. This option is for leagues that play the front and the back of an 18-hole course at the same time. Select the front course your league is playing in the “Course #1 to Play” list. Select the back course your league will play in the “Course #2 to Play” list. The courses will be assigned to each match. League Manager will place each team on the front nine and the back nine an equal number of times over the season and will also assure every team plays every other team. Note: If your league plays 3 or more courses on the same event you will need to manually specify which courses each match plays on a given event. See Manual League Scheduler for further information. After you close the “Automatic Course and Tee Assignment” form the “Start Tee Time” form will appear. If your league has tee times, type the start tee time and the time increment between tee-offs. Time increments are entered in minutes and seconds. 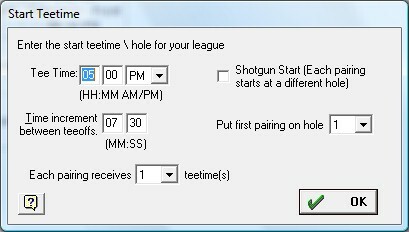 If your league runs a shotgun start (each match starts on a different hole), check “Shotgun Start” and enter the hole the first pairing will start on. League Manager will automatically mix tee times and start holes so that each team has an equal opportunity to play different tee times and start holes. Note: If your league does not have tee times or start holes just ignore this form. You always have the option of NOT displaying tee times and start holes on reports. When you click the OK button on the "Start Teetime" form, the "Optimizing Teetime rotation" form appears. League Manager's Automatic Scheduler is in calculation mode and will continue indefinitely until you click the "Finished" button. To print the League Schedule, click the Print button. You can alter the appearance of the schedule by selecting options on the Utility and Display menu. For example, you can change the font size, hide pairings for manually paired events, or even export the schedule to Excel or HTML format if necessary.